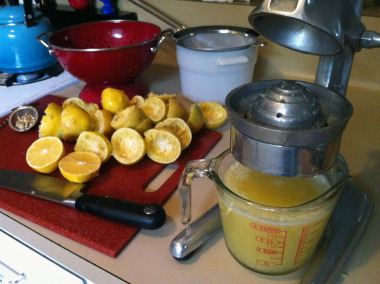 I’ve found a new answer to the adage ‘when life gives you lemons…’; I say make jelly. Cranberries have a ton of pectin power, which the lemon juice is now lacking (devoid of its sheath of pith, seeds and rind). Both of these fruits are likely to be found lurking in your winter kitchen. What’s a Meyer lemon, you ask? This jelly is slightly tart, but just perfectly so. Skip sealing the jars if you’d like, two half-pints aren’t a huge burden on fridge space. They’ll keep in the fridge for 6 months or longer. 3. Once sugar granules have dissolved, add 1 cup fresh or frozen cranberries and 1/2 cup water to the pot. Turn heat up to medium-high until it boils. Reduce heat to a simmer and cover pan, simmer for 5 minutes. 4. Remove pan from heat and mash cranberries with your spatula. Strain cranberry mush from your jelly using a fine mesh sieve. Clean preserving pan to remove cranberry carnage if necessary. Now is the time to taste the jelly to see if you’d like it sweeter, and if so, add more sugar. Return strained juice to pan and boil over med-high heat until you reach a set. 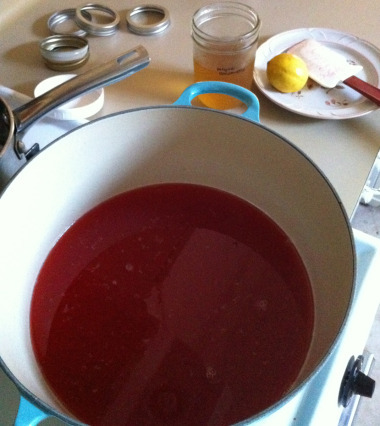 You’ll know your jelly is done when the bubbles have spaced out, and they are larger and become darker in appearance. Depending on your pot, this will take anywhere from 8-12 minutes. Skim foam if necessary. Check out this post for tips on getting jelly to set, including the frozen spoon test. 4. Once your jelly has reached a set, remove pot from heat. Zest 1 lemon directly into the pot and add 1/2 tsp vanilla extract (or another other pure extract or homemade liqueur) if desired. 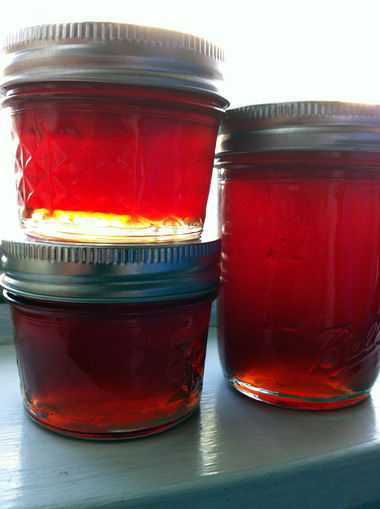 Let jelly infuse the new flavors for 5 minutes while you pull your jars out of the canner pot. Now is a good time to allow your lids to simmer (not boil) in a small saucepan. Ladle mixture into sterilized jars leaving 1/2”-inch ‘headspace’, the distance between the fruit and top of the rim. Wipe rims with dampened, clean cloth or paper towel. Seal with two-piece lids. 5. Process for 5 min in boiling waterbath.